I am a self-proclaimed hopeless romantic. My stories almost always have a happy-ever-after ending and leave you feeling satisfied that the characters have had or are walking into a life of complete fulfillment. I do, however, enjoy throwing in some thrills and twists along the way. 20 faith-based short stories exploring pivotal times and journeys in our lives. Walk with Darcy Adams in “A Ready Heart” as her heart accepts that God has a way of taking the bad in our lives and allowing us to use it to do good; get warmed by the dawning in “A Light That Shines In Winter” as Angelina realizes the good her husband has done will always shine even in the cold darkness of winter. Experience the humorous transformation to “A Woman Of A Certain Age”; believe with the unnamed heroine in “Twenty-one Days Of Believing” when all others have given up hope; eat “Dark Chocolate” with Tamra Collins as she finds love at a most unexpected time; watch the wounds of betrayal heal in “Unwanted”; and many, many more in Becoming… a heartwarming, blossoming color march through life. 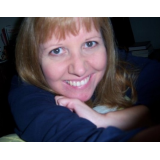 In April of 2009 I began submitting stories to the weekly challenge of FaithWriters.com. I didn't WANT to, however, the pressure of the hand of my long-time friend and co-writer, Patrick Sipperly, was unbearable against my back. To my surprise, my very first submission was awarded a second place in my level. I was thrilled and encouraged to continue. Since then, the majority of my stories have placed in my level as well as in the Editor's Choice top picks. I decided to compile some of these inspirational stories into a book exploring pivotal times and journeys in life. While I would not call these stories "religious", they are positive and uplifting. I have always used reading as a time to take a venture outside my own world. I never wanted to go on a "trip" into sadness (even though that is often a part of stories just like in real life). I love the positiveness I can bring to my stories because there seems to be so much negativity in life today. I've fashioned my own writings to help my readers accomplish just that....a trip into the world of uplifting fantasy that hopefully leaves them with a satisfied aaah.